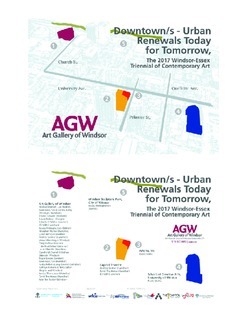 Downtown/s - Urban Renewals Today for Tomorrow, The 2017 Windsor-Essex Triennial of Contemporary Art brings together examples of contemporary art made by 22 artists living and working in Southwestern Ontario, Windsor-Essex and the Greater Detroit region surrounding the theme of downtown - downtown destruction and downtown renewal. Since the Great Recession, and the major economic downturn that started in 2008 as well as Detroit’s bankruptcy in 2013, Windsor has seen a significant amount of change and transformation in the last decade. Like many other urban centers across North America, this city has continued to experience a variety of shifts in economic, agricultural, social and cultural growth. To reflect the expanding footprint of Windsor’s new downtown core, artists are engaging with and presenting work in additional venues, including the University of Windsor’sSchool of Creative Arts, the Windsor Symphony Orchestra, Capitol Theatre, Windsor Sculpture Park – City of Windsor and Artcite Inc. In its entirety, this year’s Triennial is a call to action – an invitation to the public to experience anew the City of Windsor, albeit from its alleyways to its picturesque waterfront. The AGW would like to acknowledge the City of Windsor and funding support from the Ontario Arts Council, an agency of the Government of Ontario, the Ontario Trillium Foundation and the Canada Council for the Arts and Co-sponsor, Windsor Family Credit Union. Watch The Windsor Star's interview with Curator of Contemporary Art, Dr. Jaclyn Meloche.